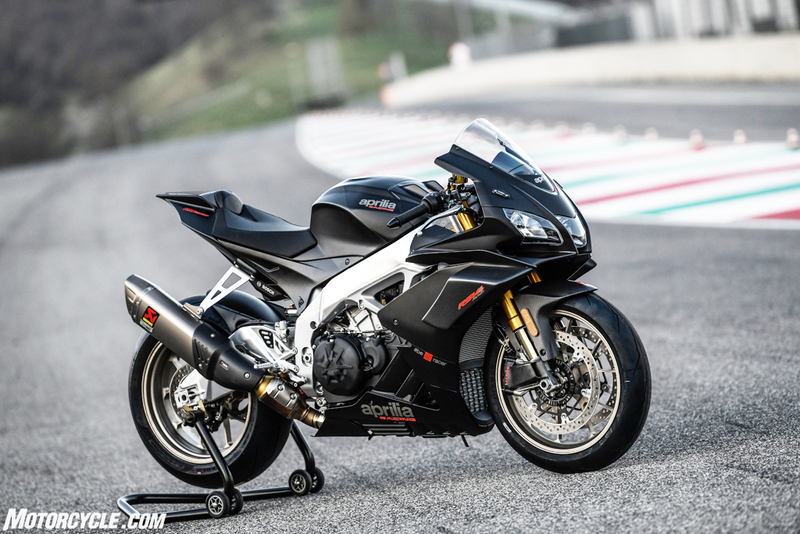 Blah, blah, blah, we say it all the time – the Aprilia RSV4 is one of our favorite bikes ever. But seriously, it really is special. So how, then, does one improve upon a fan favorite? Give it more power, of course. 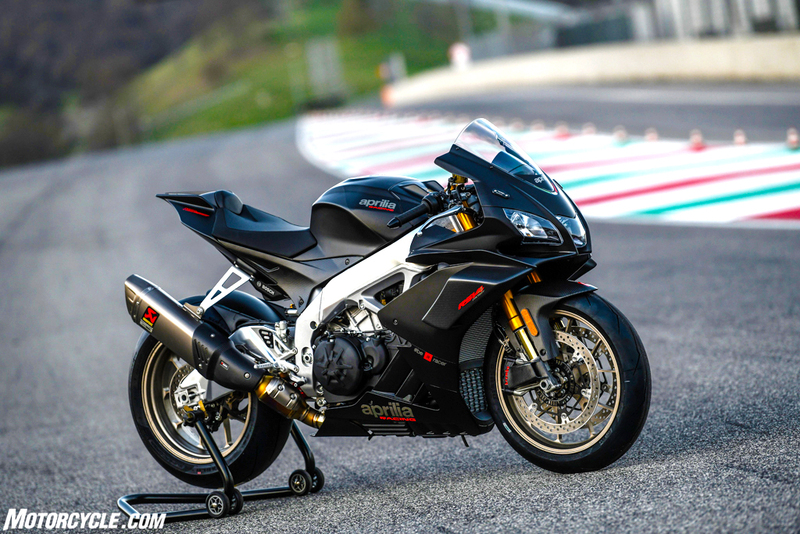 That’s exactly what we have with the new 2019 Aprilia RSV4 1100 Factory. 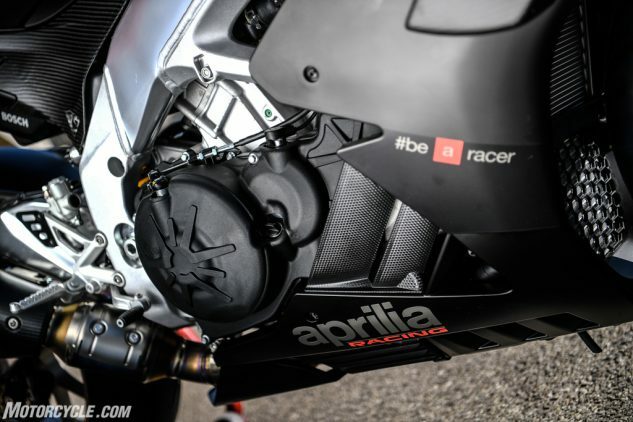 On the surface, you wouldn’t necessarily be wrong in saying Aprilia telegraphed this move long ago – four years ago in 2015, actually – with the Tuono 1100, even though doing so would make the RSV4 illegal for basically every racing class out there. This is exactly right. 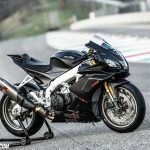 In studying the market, Aprilia has seen a shift in the supersport class, as less people are buying sportbikes for racing and are instead looking for a premium product – meaning there’s a growing niche within the already small sportbike niche of buying liter-class machines for the prestige and enjoyment of owning and riding an exclusive product, not for trophies or contingency money. The example given comes from the car world, where some of today’s supercars never see the racetrack and, in fact, aren’t eligible for any specific classes. 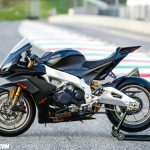 It’s with this reasoning that Aprilia reps admitted the 1000cc displacement cap was more of a “psychological limit.” Going over it would move the model line away from racing and into the premium market realm. 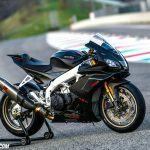 While the RSV4 RR will still be available with the 999cc V4 for racing purposes, the Factory version sees displacement bump up to 1078cc with, yes, a similar engine used in the Tuono 1100. 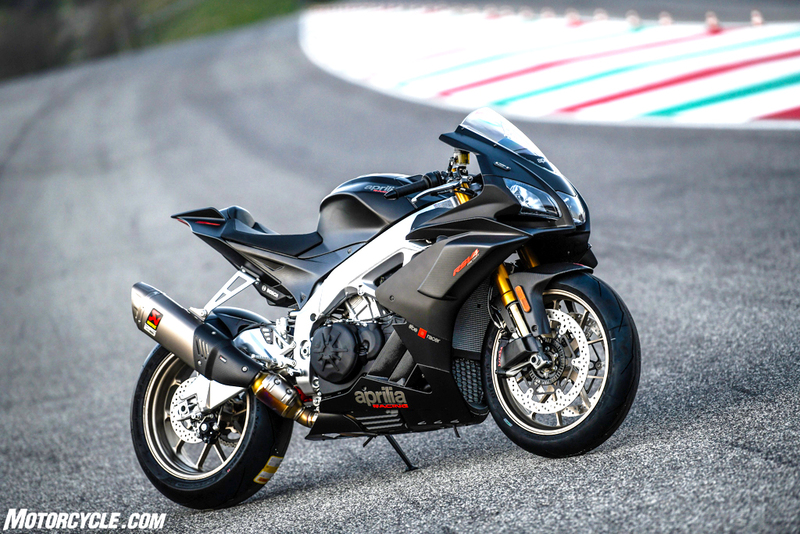 I say similar because Aprilia didn’t simply stick the Tuono engine in the RSV4 and call it a day. 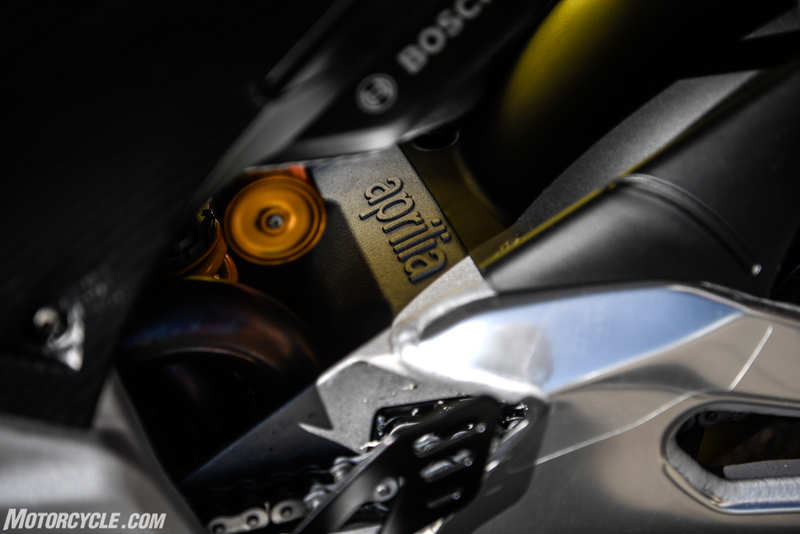 The two engines are vastly different – so different, in fact, that Piero Soatti, Head of Body and Chassis Engineering states that, while the physical dimensions of the two engines are the same, they are quite different inside. Most of the differences are found in the top end of the engine. 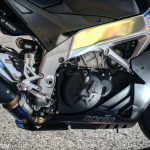 The RSV4 gets its displacement bump by adopting the Tuono 1100’s 81mm bore, but from there the RSV gets different camshaft profiles, a revised intake port, and twin injectors (including an overhead shower injector, which the Tuono doesn’t have) per cylinder. 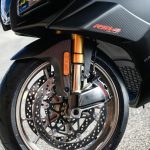 The connecting rods and crankshaft are different pieces compared to the Tuono as well and are said to be slightly lighter. 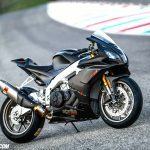 Compared to the previous, 999cc RSV4, the 1100 sees new pistons to accommodate the bigger bore, though compression ratio stays the same – an already lofty 13.6:1. 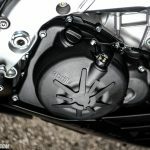 Two piston cooling jets squirt oil onto the underside of the piston to help decrease temps, and a high-flow oil pump borrowed from the Tuono 1100 helps, well, pump that extra fluid. The throttle shaft itself has been redesigned with a different aero profile to help increase intake air speed. 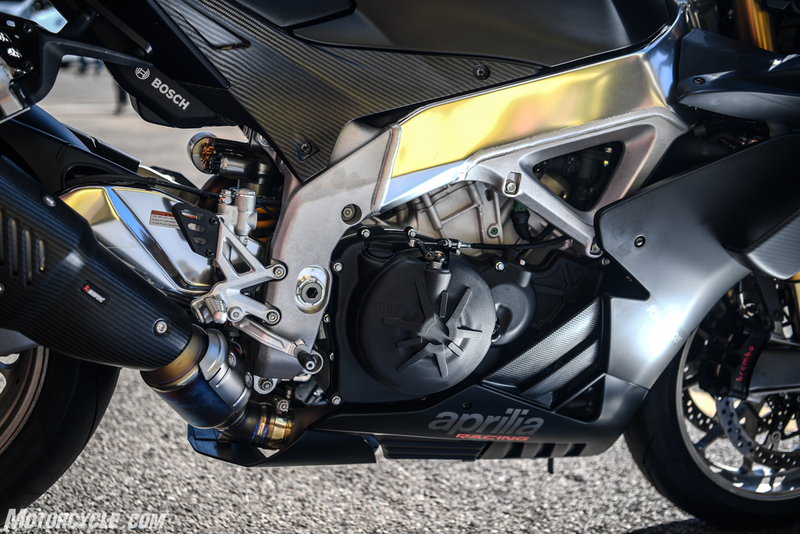 Seeing the spent gasses out of the engine is a titanium Akrapovic pipe Aprilia somehow homologated for road use despite its noticeable bark over the standard pipe on the RR. 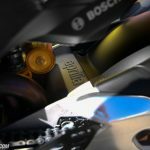 Aprilia says the pipe connection geometry has been optimized (which makes one wonder just how bad things were before). A Magneti Marelli 7SM ECU handles the computing power. 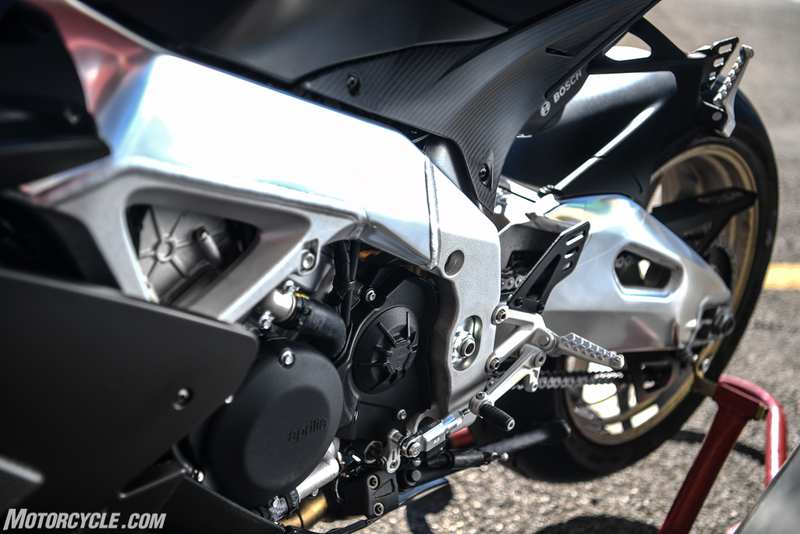 On the outside, the RSV4’s engine and chassis look the same as ever, but inside you’ll find a ton of changes. Note the adjustable engine mount on the frame. 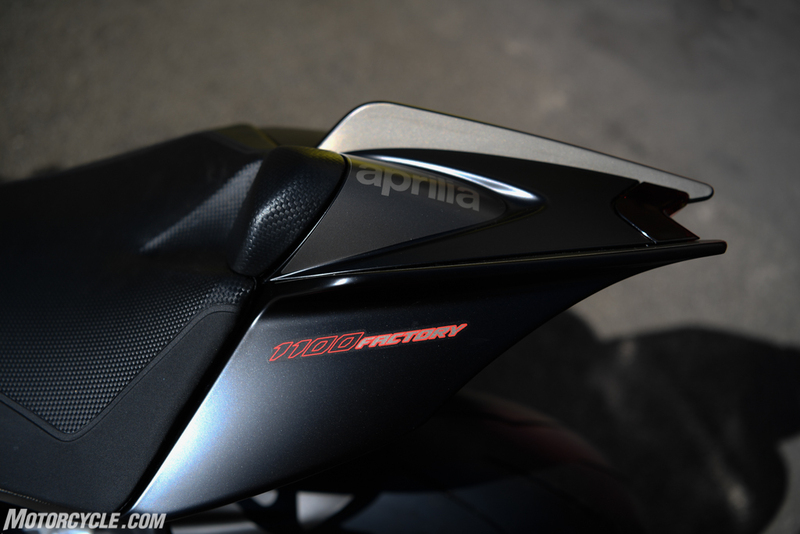 Speaking of power, Aprilia claims 217 (crankshaft) hp @ 13,200 rpm and 122 nm (90 lb-ft) of torque at 11,000 rpm. Compared to the 999cc V4, that’s a 16 hp and 7 nm bump, respectively. 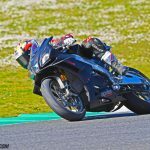 Accounting for a roughly 10%-15% drivetrain loss, the RSV4 1100 could actually be making a true 200 horses to the wheel! All this while shedding 5 kg (11 lbs.) 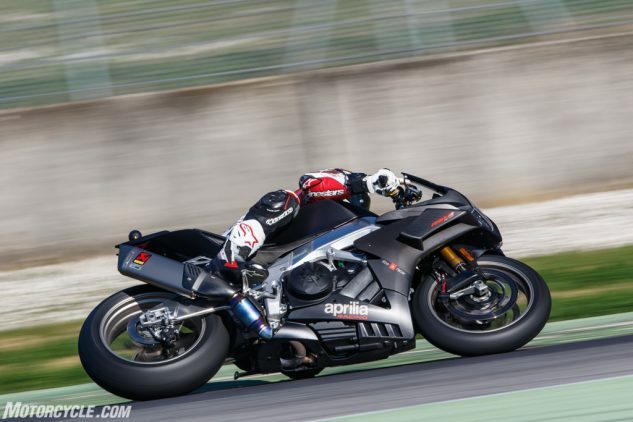 compared to last year’s RF model, much of that weight coming from the exhaust and a new Bosch lithium-ion battery. As you’d expect, the 1100 also makes more power across the rev range compared to the previous 999cc model, with clean fueling throughout, just like the older model. 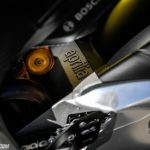 While the engine usually gets most of the attention, there are obviously other changes as well. They are little but quite extensive, and they all add up. 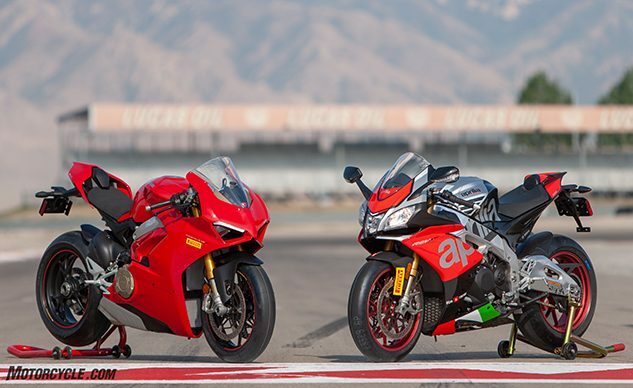 At the gearbox, the RSV4 adopts the same taller fifth and sixth gears as the Tuono 1100. 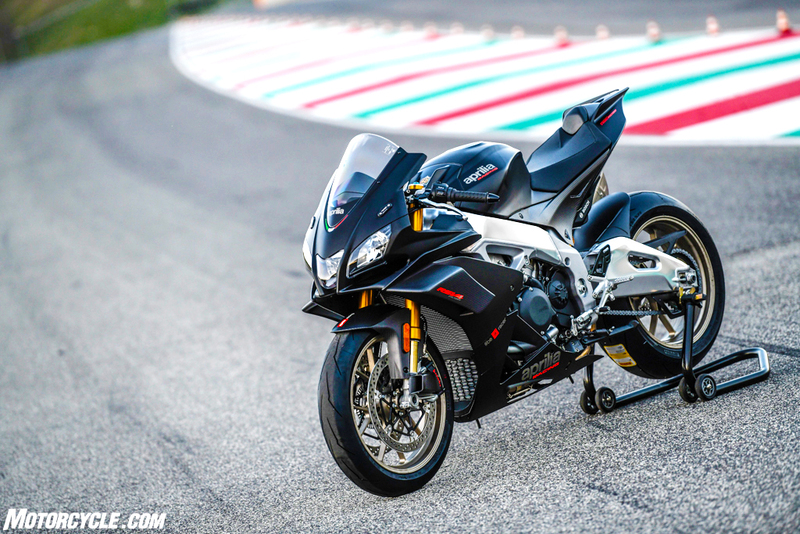 Moving to the chassis, it’s still the same basic aluminum dual beam frame with pressed and cast sheet components, and it’s still the only production superbike that allows for adjustable engine, swingarm, and rake position. For 2019, the 1100’s steering head angle (aka rake) has been changed via the adjustable bushing, and the triple clamp is offset 30mm, a -2mm adjustment from last year to make up for the rake change. Rake is set at 24.5º and trail at 4.1 inches. 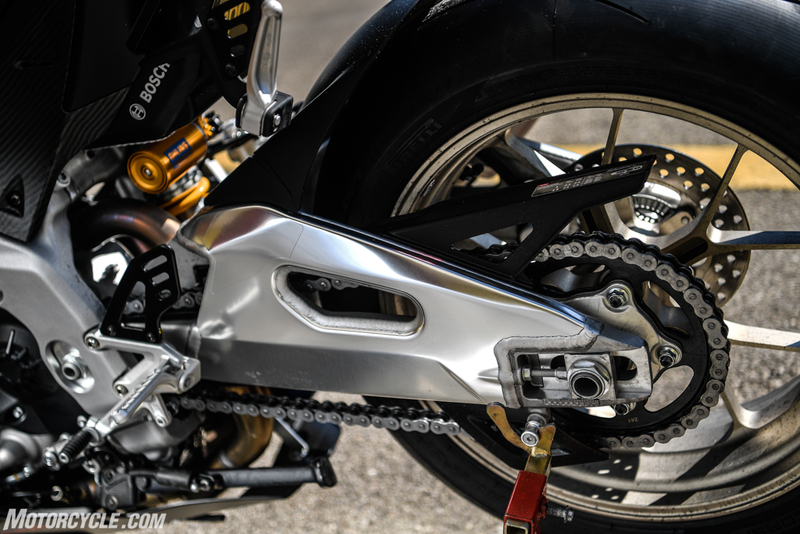 Out back, a stiffer swingarm along the yaw axis, ie. laterally, compared to 2018, helps deal with the increased power. 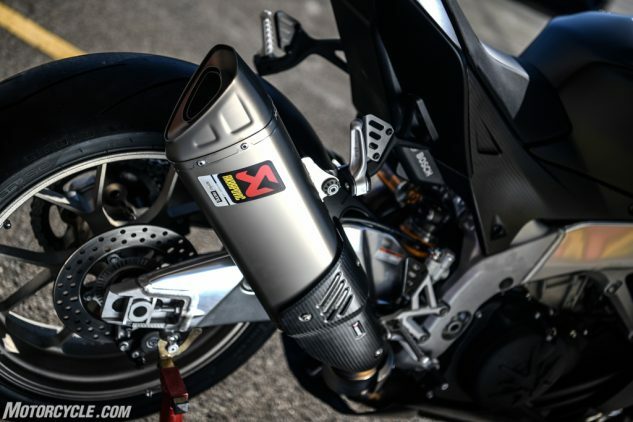 RSV4 1100 Factory models will come off the production line with this titanium Akrapovic exhaust. It’s noticeably louder than the standard RR exhaust, and yet, somehow, they found a way to convince governments around the world that it meets regulations. I’m not complaining. 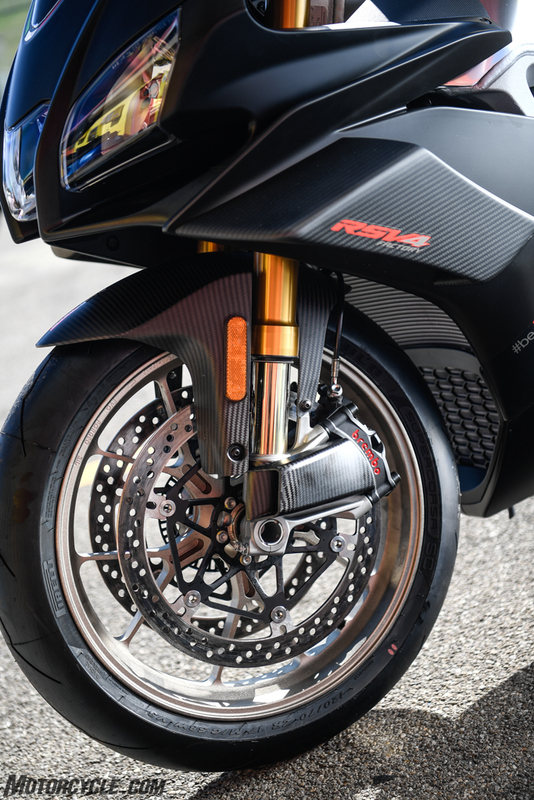 On the braking front, the 330mm discs get Brembo’s latest Stylema calipers, up from the M50 of before, with a more aggressive brake pad – the BRM10H. 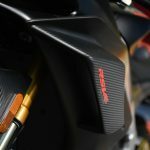 Aprilia says this change not only shaves 65g per caliper, but the Stylema’s design also provides better ventilation for both the pads and the discs. 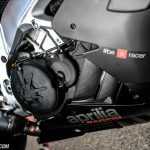 Keeping the brakes cool was apparently a big concern for Aprilia, as they pondered several schemes to keep the components at the appropriate temps. 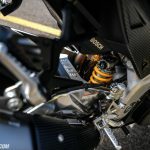 Some of Aprilia’s competitors, according to Soatti, put as much as 215mm between the fork stanchions to put a greater distance between the two sets of brakes up front and provide slightly better flow. 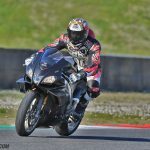 Doing such, says Soatti, negatively impacts handling, and this is the one area Aprilia is not willing to compromise with the RSV4; its agility is thanks in part to its 205mm gap between fork tubes. The solution was to borrow some technology from MotoGP and adopt carbon fiber brake ducts, a $195 accessory. CFD testing shows the scoops reduce both caliper temps and lever stroke extension by 20% compared to no scoops. 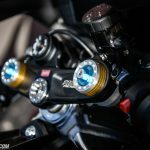 Lastly, the fully-adjustable Öhlins NIX fork receives 5mm more suspension travel to help cope with the added braking force needed to slow down the 1100. 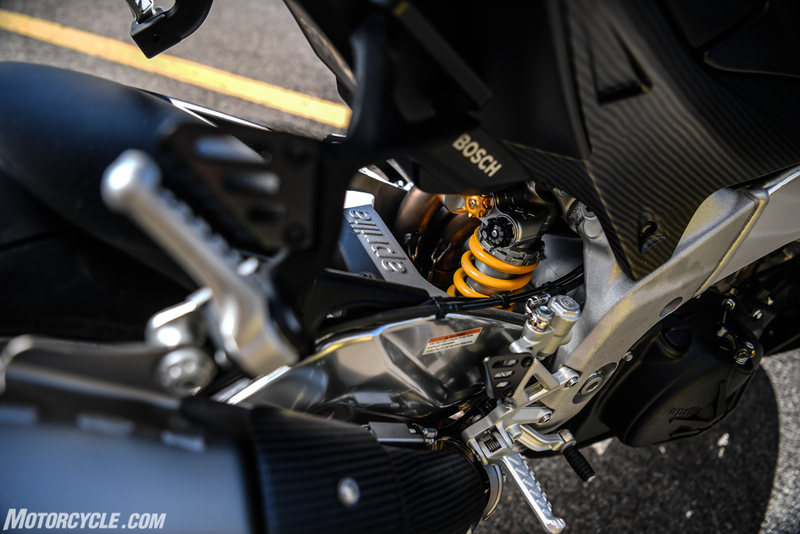 A fully-adjustable TTX shock is in the rear. Like Red Bull, Aprilia gives you wings! 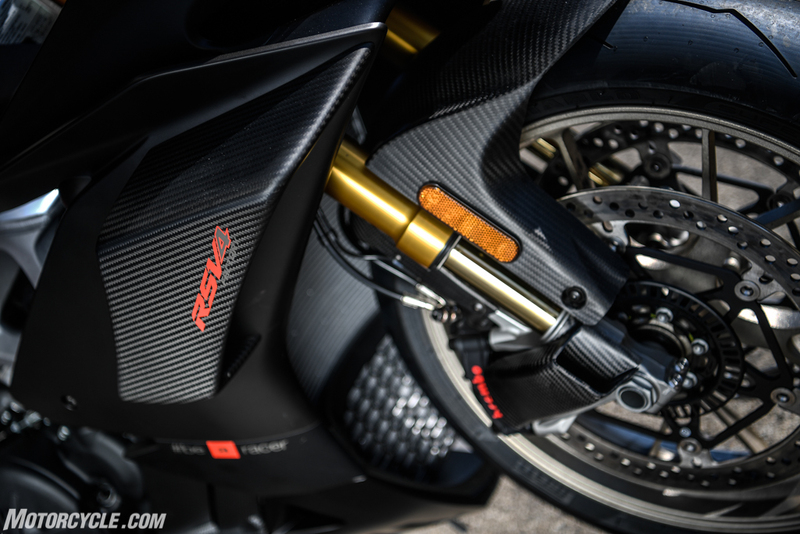 Note also the accessory carbon brake duct. 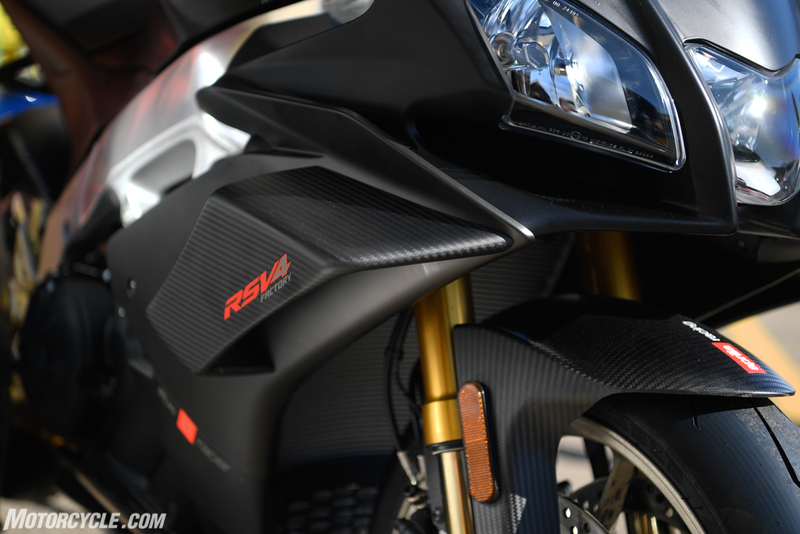 All the rage in MotoGP, winglets have now made their way onto a mass-produced streetbike with the RSV4 1100 Factory. 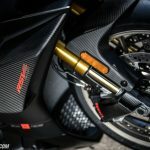 Made from carbon fiber, the two wings are said to provide downforce to help the RSV4’s front end feel more stable at high speeds and during initial braking from those high speeds. 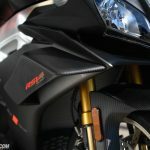 And because no presentation is complete without some pictures, Aprilia reps even showed us a computer-aided rendering of the RSV4 with and without wings and the change in airflow between the two. 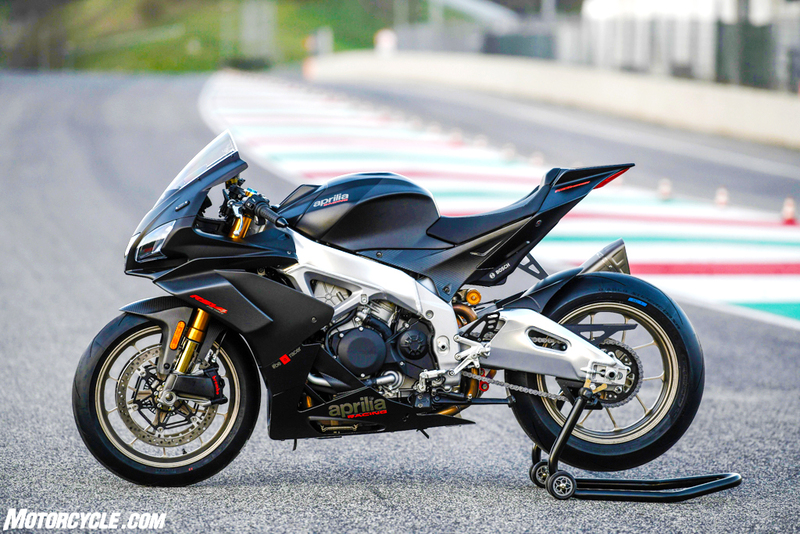 As should be a shock to no one, the bike with wings produced… wait for it… downforce. 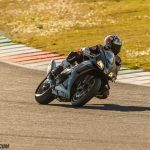 There might be no better place than the legendary Mugello circuit in the Tuscan valley in Italy to let an 1100 stretch its wings, err, legs. 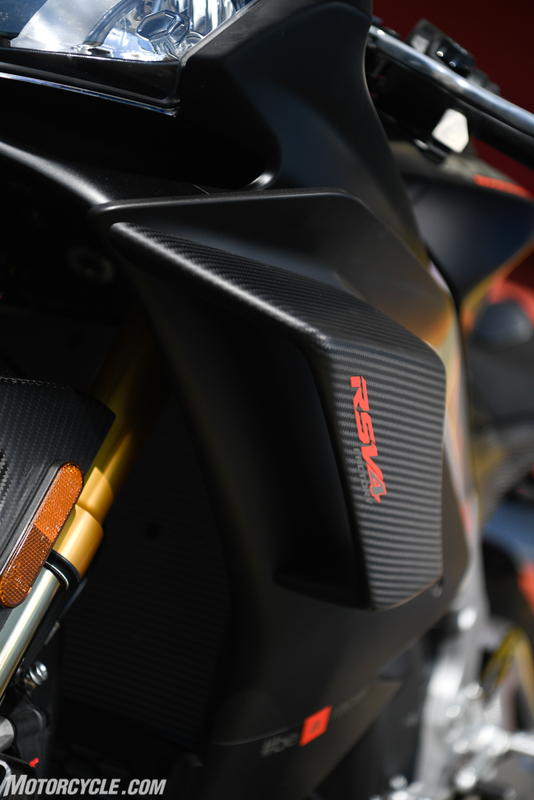 Its fast, flowing corners highlight the RSV’s cornering agility, while its 1.1 km straight is one of the few places on earth you can tickle redline in sixth gear. 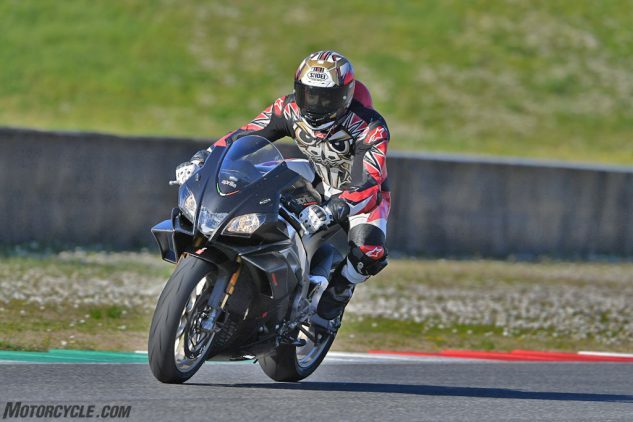 Now, normally anybody in their right mind would suggest against learning a new track, especially Mugello, aboard a fire-breathing 1100, but if you don’t have another choice like I didn’t, the RSV4 1100 is not a bad place to be. This is what it looks like to miss an apex by a country mile and still feel comfortable leaning over more to try and make up for it. 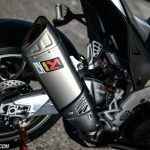 The RSV4 inspires confidence. 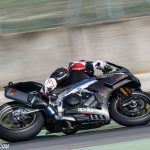 With only four 15-minute sessions to learn a daunting new course and look somewhat presentable for the photos you see here, learning everything there is to know about the new RSV4 1100 Factory was next to impossible, but a few things were abundantly clear. 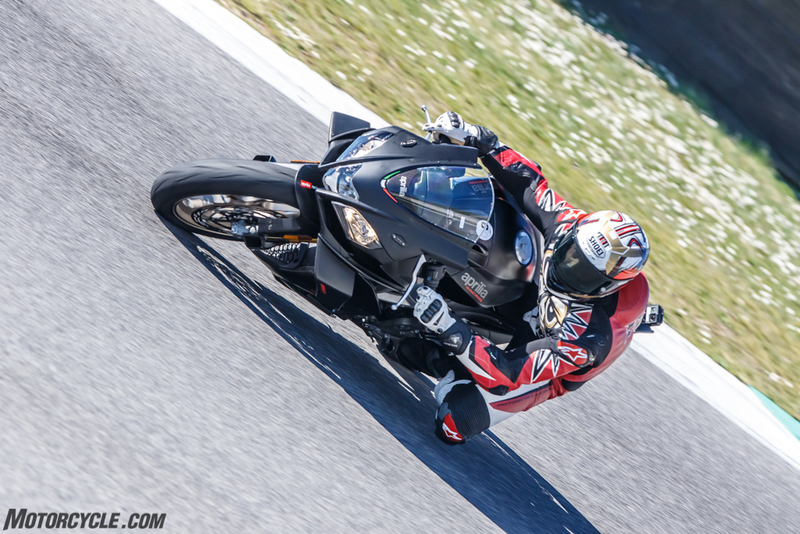 First and foremost is the additional power; it’s there, it’s unmistakable, but it comes on deceptively smoothly. 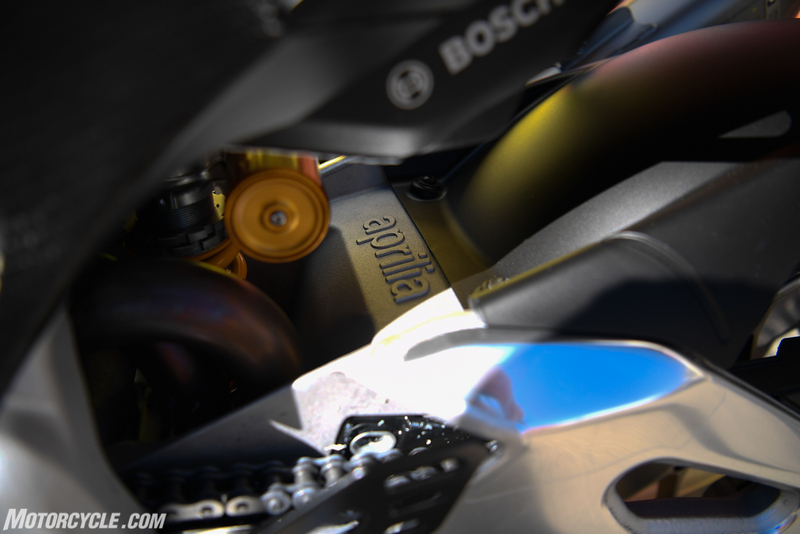 Having sampled only Track and Race power modes (the two most aggressive modes, Sport being the most docile), it’s impressive how well Aprilia have dialed in the bike’s fueling. 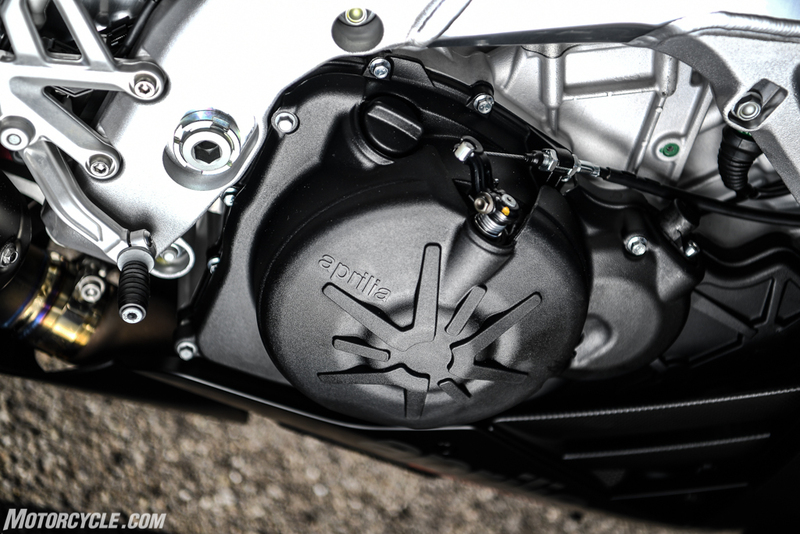 The normal on/off hiccup we experience on many other motorcycles isn’t perceptible here. 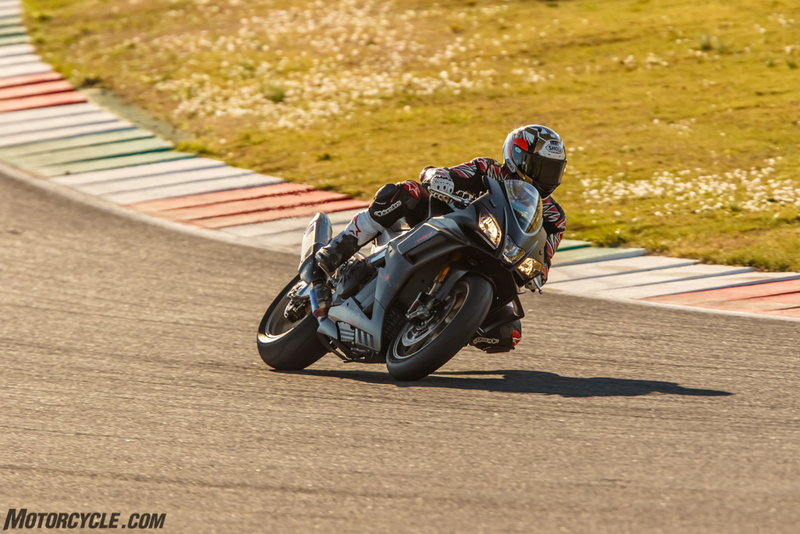 Where the 1100 really comes alive is down Mugello’s long straight. 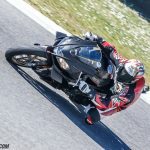 You approach from Turn 14, aka Bucine, a long, second-gear downhill left, and as all 217 horses are unleashed, the bike drifts out to the tri-colore paint. 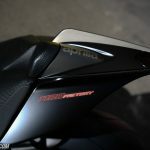 Tuck into as tight a bubble as possible, click through the gears in rapid succession (even fifth and sixth), and hold on tight as the speedometer on the TFT display climbs higher and higher. Past the start/finish line the throttle is still pegged, the speedo tips past the 300kph mark, and it’s all you can do to guide the machine over the painted curbing separating the track from pit exit, which puts you on the correct entry for turn one. 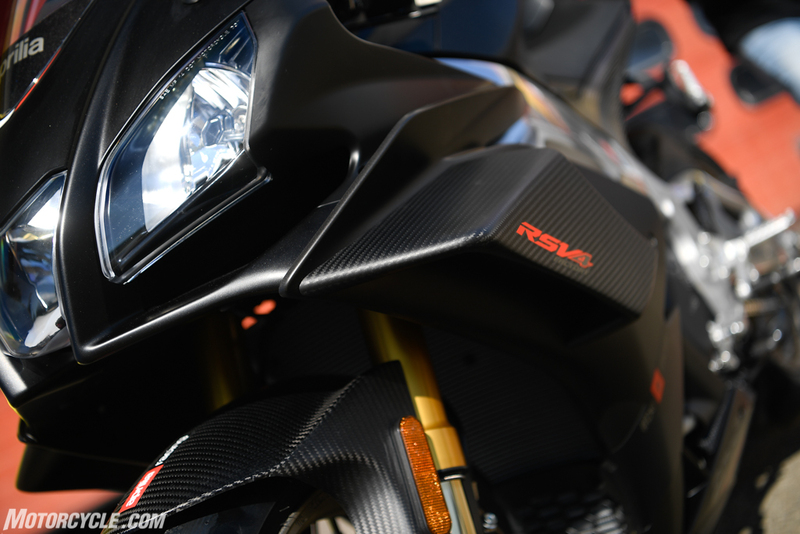 So far, the front end of the RSV4 feels glued to the ground, but having never ridden anything else with wings, it’s hard to say if they were the reason. 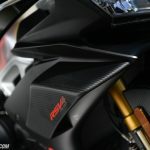 It’s hard to say whether the winglets really make a difference without having a non-winged version to compare to, but the RSV4 1100 definitely felt planted and secure under braking. Another 1/8-mile or so later, speedo somewhere in the 306-312 kph range, and you’re cresting a small hill which, at these speeds, is enough to loft a small power wheelie in sixth gear (if you’re brave enough). The (adjustable) wheelie control kicks in (as indicated by lights on the dash) to bring it back down gently, and no later is it time to grab a handful of brakes. As you pop out of the bubble, the rush of air hits you like a truck to the chest, but the Stylema calipers never waver, consistently slowing the bike down, lap after lap, with good feel at the lever. 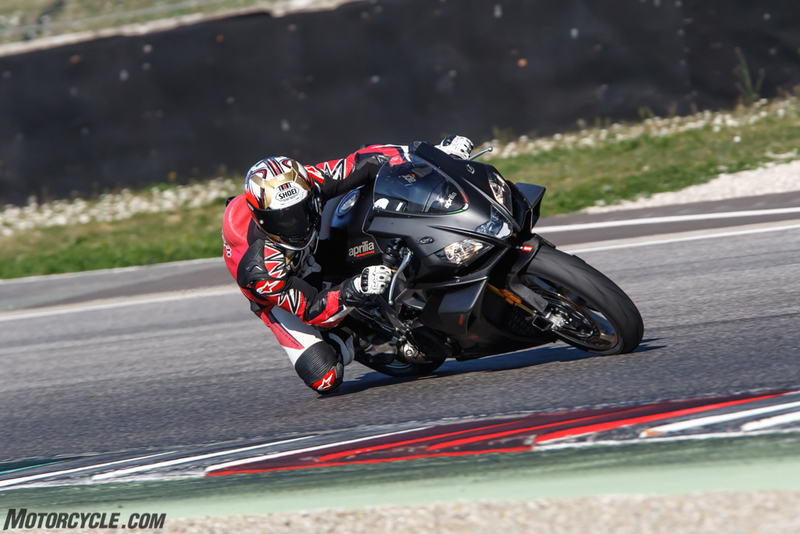 Fire off four downshifts, the excellent quickshifter eliminating the need to use the clutch, and tip the bike into San Donato to start a new lap. Cornering ABS is there to guide you in case you’re squeezing the lever too hard. What you don’t see on TV while watching a MotoGP race at Mugello is the amount of elevation changes combined with direction changes – ingredients which make for a favorite rider’s track. 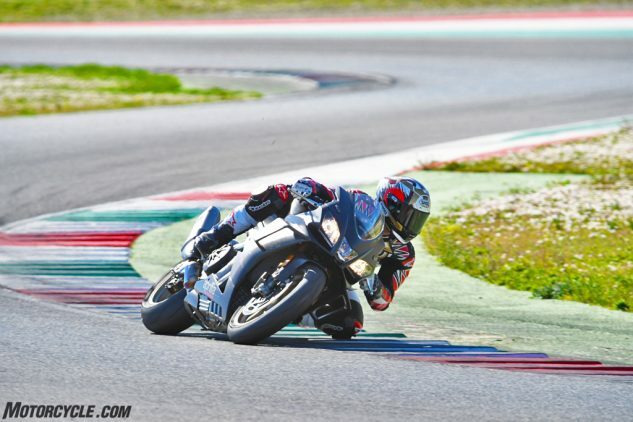 These characteristics also test a motorcycle’s agility, as Mugello features many corners with wide entry points but very narrow exit points. 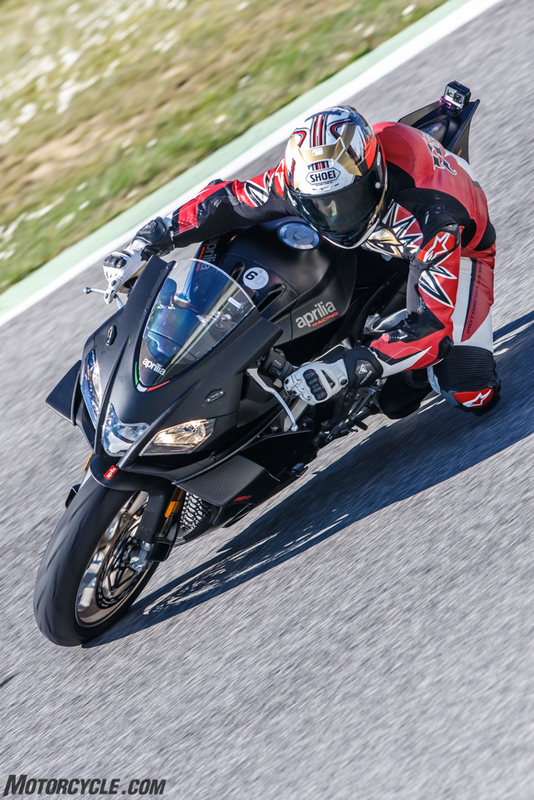 As always, the RSV4 1100 impresses in this department, with excellent turn-in and a confident front end, especially on the brakes. 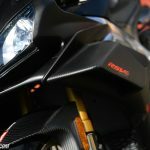 Flip-flopping through chicanes shouldn’t be this easy on a big bike, and if you’re skilled enough to look at the TFT dash, made brighter for 2019, you might be able to sneak a peek at the lean angle indicator, too. Because there were more journos than there were motorcycles, the bikes were constantly on track. This meant Aprilia had technicians changing out Pirelli Supercorsas (SC1 compound rear, and I think SC2 front) every hour, sometimes more frequently. As far as longevity was concerned, the tires didn’t necessarily need to be changed so often, but the drop in performance was noticeable, which says something about the ferocity of the beefed up engine. Thankfully, Aprilia’s traction control system has your back. 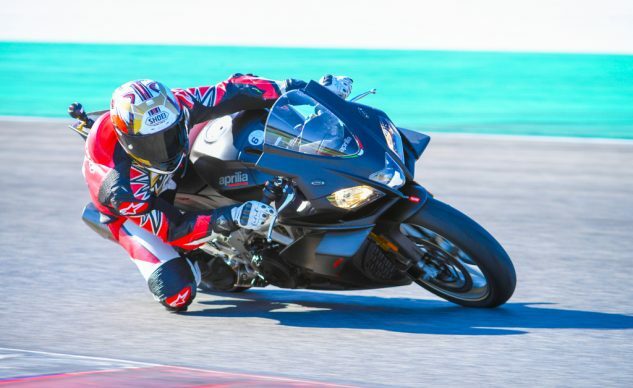 Initially set to level 5, I could feel TC kicking in even with new tires, the intervention feeling like a non-linear connection between my throttle hand and the rear tire. Lowering to level 3 with just a few taps of the handlebar buttons I’m sure TC must have stepped in, but with everything else happening around me I couldn’t perceive it. Such is the level of refinement of the latest APRC system. How good is the Aprilia chassis? By my second lap the ‘ol elbow was already on the ground. With such little riding time, making suspension tweaks wasn’t high on my to-do list. The NIX/TTX Öhlins combination was close enough in the ball park as-is to allow me to focus on learning the bike and the track as best I could. That said, these components are well spoken about in the past, and I have no reason to believe things would be any different on the 1100. Gripes are few, but the compact riding space meant I couldn’t move far enough back in the seat to avoid having my elbows and knees touch in a tuck. A slightly bigger windscreen would be nice, especially at 300 kph. Otherwise, I’m only disappointed that, if it were mine, I wouldn’t have a tire budget big enough to keep up. 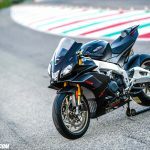 Having established where the RSV4 1100 Factory stands in its own right, the next natural question (or perhaps your first) is how it stacks up against Ducati’s Panigale V4 S. Well, let’s not forget the Ducati’s V4 is 1103cc – 25cc larger than the Aprilia. 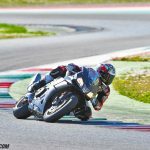 However, the RSV4’s sublime handling abilities haven’t been sacrificed in the slightest (at least in the short time I had with it). 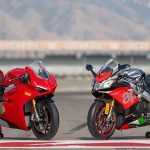 Without a back-to-back comparison, the best way I can describe the two is like this: As I’ve said before, the Panigale V4 S in one word is relentless. The power is raw and in. your. face. Corners are simply an obstacle to clear before unleashing the fury again. 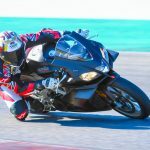 A decade later and the RSV4’s basic styling hasn’t changed much – and I haven’t met one person who seems disappointed. 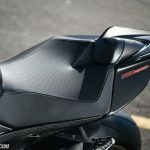 Miguel Galluzzi, the creator of the Ducati Monster, hit another home run, and whoever thought up the color name – Atomico 6, as in, the atomic number of carbon, the material seen throughout the bike – deserves a raise. 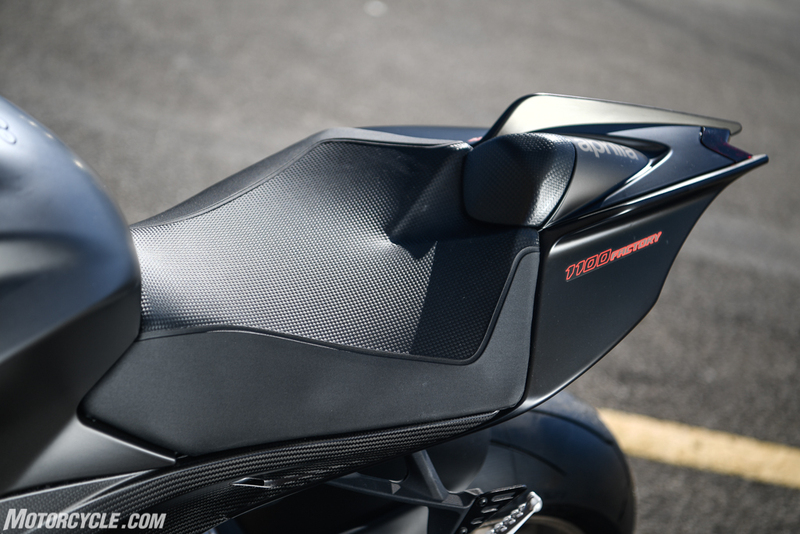 Make no mistake: this is one fast motorcycle, meant for the customer who doesn’t want any compromises. At $24,499, you can come to your own conclusions on price, though it comes $3,396 less than the Panigale V4 S ($27,895). 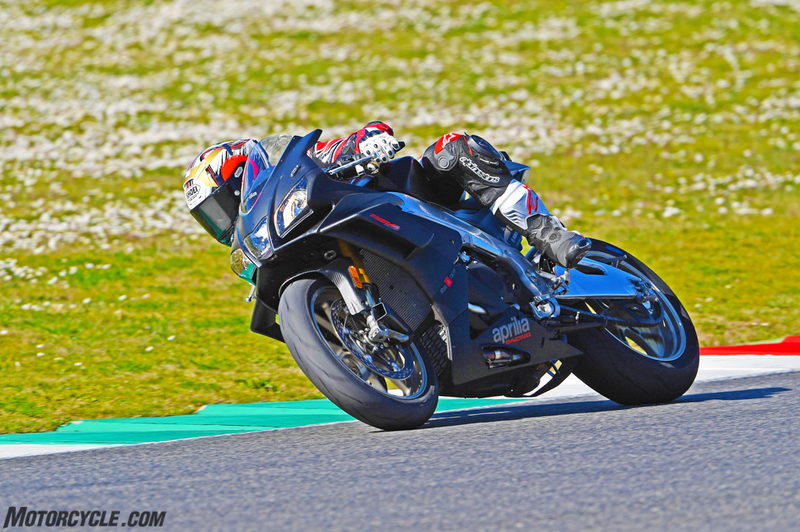 It’s crazy to think the RSV4 platform is celebrating its tenth birthday. 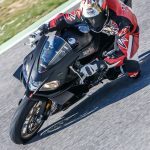 It’s even crazier to think that, despite how many times its competitors have revamped their flagship literbikes, the Aprilia has remained relevant. 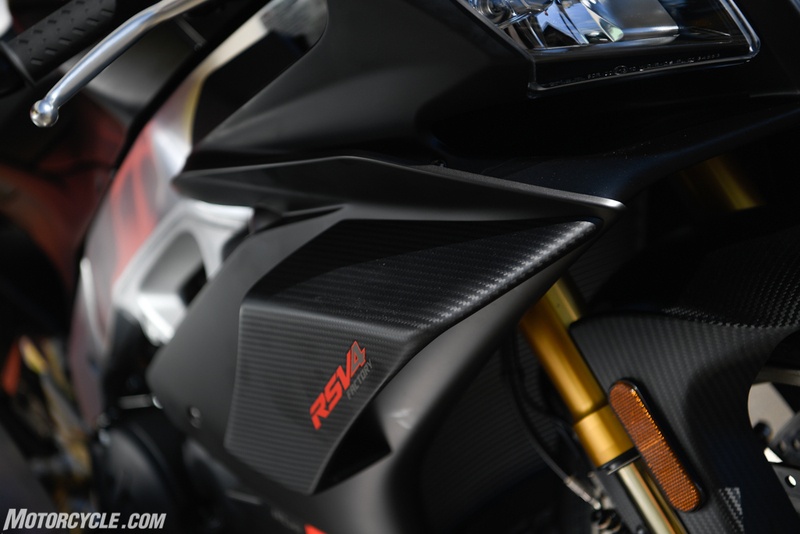 In fact, the RSV4 is more than relevant, it’s becoming a standard bearer – a testament to evolution over revolution when what you start with is on point. Now with an even bigger engine, it’s hard to find any faults. An all-new model is destined to come someday, but like displacement, age is nothing but a number. 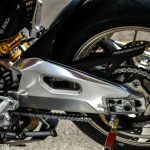 Rear Suspension Double braced aluminum swingarm; mixed low thickness and sheet casting technology. 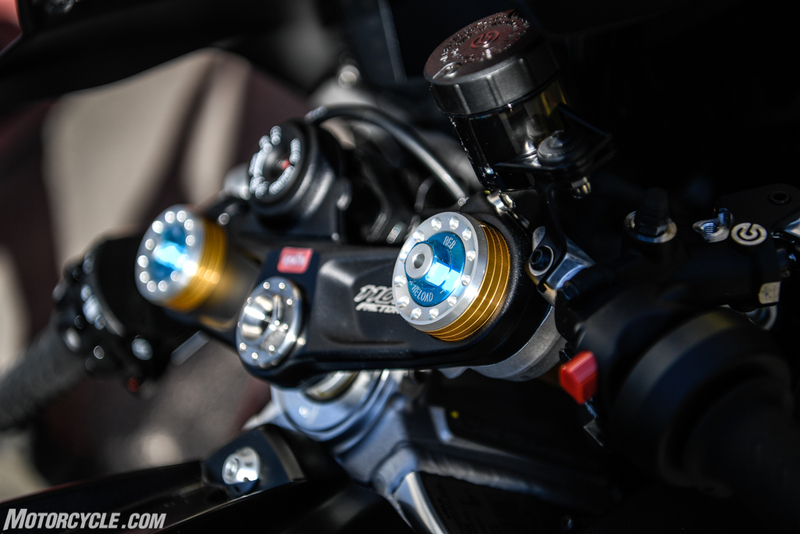 Öhlins TTX monoshock with piggy-back, fully adjustable in: spring preload, wheelbase and hydraulic compression and rebound damping. 4.7 inches wheel travel.